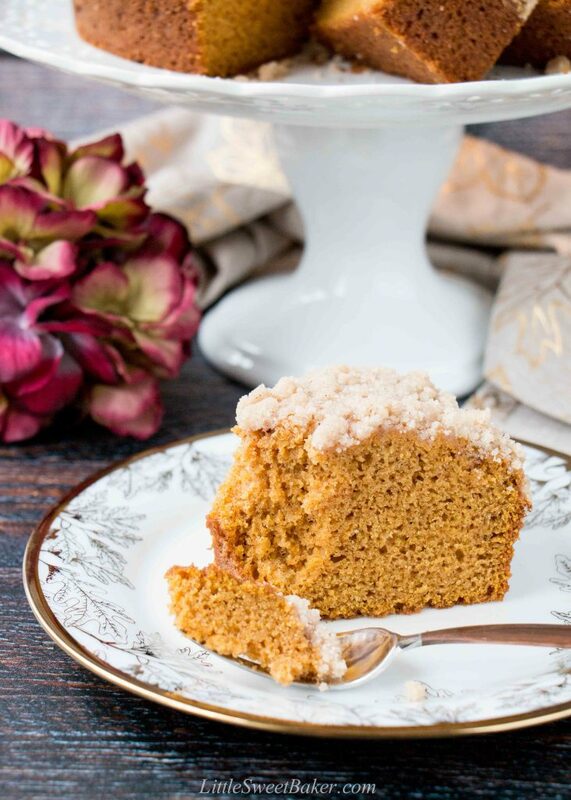 This pumpkin spice coffee cake is soft, moist and topped with a crunchy crumb topping. It’s packed with pumpkin flavor and fall spices. It’s easy to prepare and beautiful to serve. 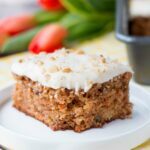 The Canadian Thanksgiving is this weekend, so on my menu is this easy-to-make and easy-to-serve coffee cake that is flavored with the taste of fall – pumpkin spice! 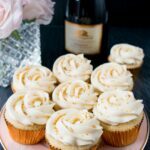 Served with a nice cup of coffee or tea, it’s the perfect ending to a lovely Thanksgiving meal. It presents beautifully and can be make ahead of time. It’s easy to slice without any mess. This recipe starts with some flour, pumpkin spice, baking powder, baking soda and salt. Then you beat the butter with some sugar. Next come the eggs and pumpkin puree. Stir the dry and wet ingredients together and the batter is done. The streusel is simply flour, sugar, more pumpkin spice and some melted butter. Sprinkle it on top and bake! I made my cake in a tube pan with a removable bottom. You can also make this cake in a bundt pan. Just skip the streusel, add another 1/4 cup of sugar to the batter, and dust with powdered sugar if desired before serving. 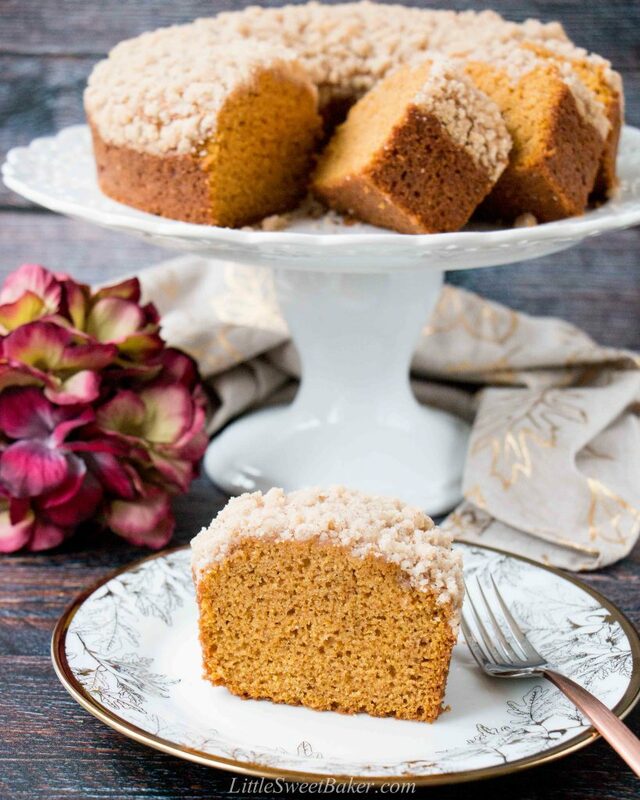 This pumpkin spice coffee cake is incredibly moist and tender. It’s bursting with pumpkin flavor and pumpkin spice. 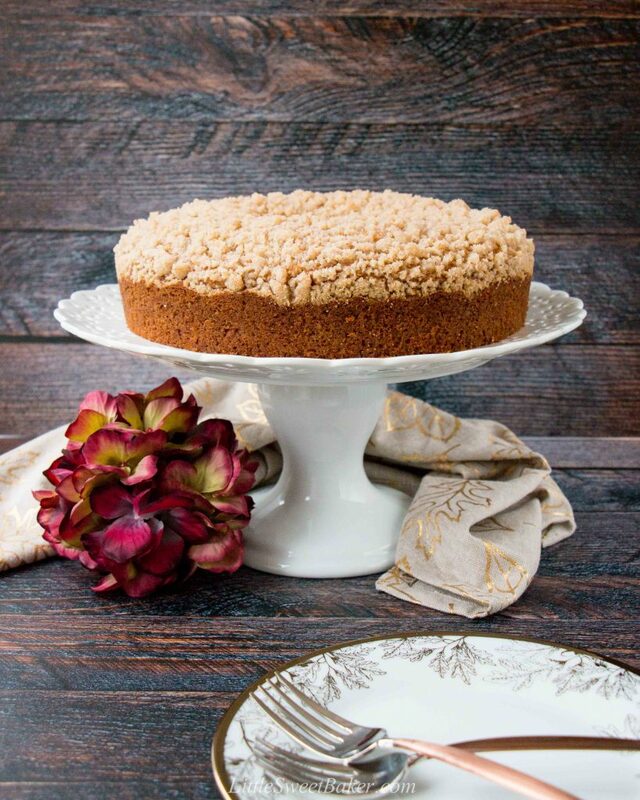 It’s topped with a sweet and spiced crumb topping. It can be served for breakfast, brunch, snack-time or dessert (basically you can eat it all day long). 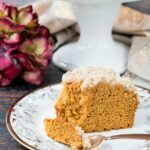 This pumpkin spice coffee cake is incredibly moist and tender. It’s bursting with pumpkin flavor and pumpkin spice. 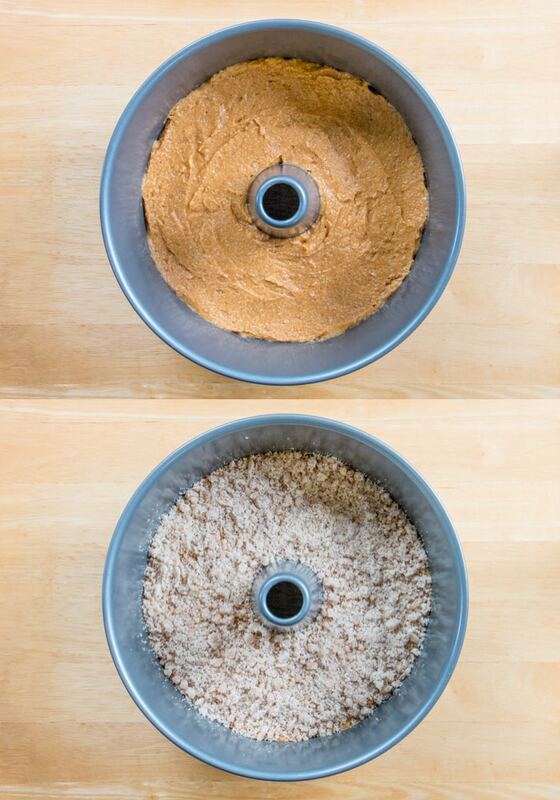 In a medium bowl, toss together the flour, pumpkin spice, baking powder, baking soda and salt. Set aside. In a small bowl, mix together all the dry streusel ingredients. Stir in the butter until all is moistened. Set aside. Using an electric mixer or stand mixer with paddle attachment, cream together the butter and sugar until combined. Beat in the eggs, one at a time, mixing well in between. Scrape the bottom of the bowl as needed. Mix in the pumpkin puree until smooth. Stir in the dry ingredients until just combined. Batter will be thick. Spoon the batter into the prepared baking pan. Break up the streusel into small pieces and sprinkle over top of the batter. Bake for 38-40 minutes or until a toothpick inserted into the center comes out clean. If preparing in a bundt pan, add an extra 1/4 cup of sugar to the batter (so a total of 1 1/2 cups sugar) and skip the streusel. Dust with powdered sugar before serving if desired. You can make this cake the night before or the morning of the day you plan to serve it. Leftovers can be stored wrapped up at room temperature for up to 3 days.